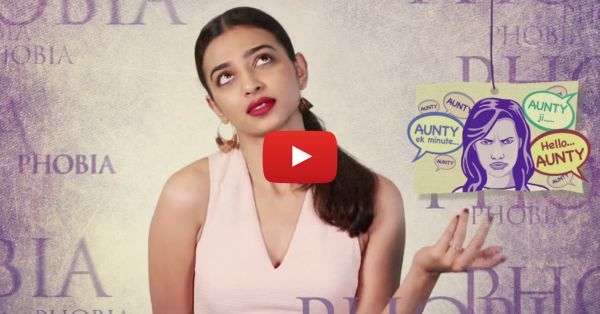 Yes, Aunty-O-Phobia Is a Thing - Watch Radhika Apte Explain! Yes, you heard us right. Aunty-O-Phobia! Sounds familiar? Or not so much? Well, we automatically drew some conclusions when we heard the term...and watching this video of Radhika Apte explaining it all made us realize our first assumption was spot on! Didn't you also automatically think of that aunty of yours who makes you wish you weren't at home when she visits? Or you hope that she didn't see you when you were at the market at the same time?! Well, if you did (and even if you didn't actually!) this video will totally crack you up! And then you'll join the rapidly expanding group of girls who claim to have this phobia! :D :D PLUS: Subscribe to POPxo on YouTube for original videos + our favourite videos from around the web! MUST-READ: Radhika Apte Has The Perfect Message For EVERY Girl! MUST-READ: Radhika Apte’s Spooky Prank Gave Us A Little Heart Attack!